A vehicle passenger was transported to Wayne HealthCare in Greenville following a Friday morning accident on State Route 49 near Abbottsville. ABBOTTSVILLE — A passenger of a vehicle was injured Friday morning after the vehicle in which he was riding in blew a tire before exiting the roadway and hitting a tree. At approximately 7:30 a.m., Arcanum Fire and Rescue along with deputies from the Darke County Sheriff’s Office were dispatched to State Route 49 South in the area of Abbottsville Church in reference to an accident with injuries. According to deputies investigating the accident, initial investigation seems to show a white Buick Park Avenue was traveling southbound on State Route 49 when it blew a tire, sending the car out of control and off the right side of the roadway. 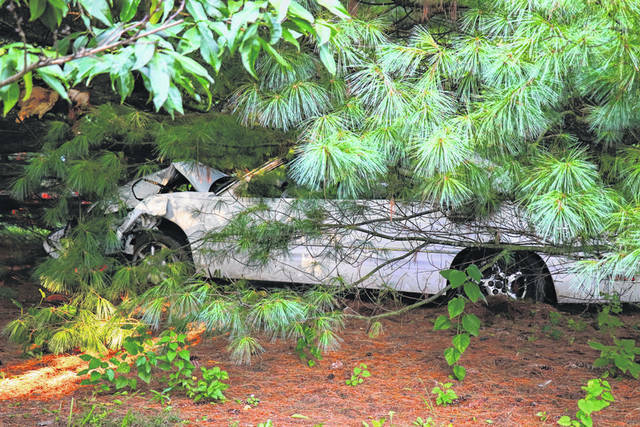 The vehicle, occupied by the driver and a front seat passenger, both males, continued to travel nearly 40 feet off the roadway before coming to rest after hitting two trees. While the driver of the vehicle was uninjured, the passenger was treated at the scene by Arcanum Rescue and transported to Wayne Healthcare for minor injuries. Arcanum Fire crews had to assist in the removal of the vehicle by trimming branches to clear a path from the cluster of trees in which the vehicle had become wedged. Minor property damage resulted.